October is one of the biggest beer festival months in Colorado. Denver celebrates Denver Beer Week and the annual biggest beer fest of them all happens - the Great American Beer Festival. Oktoberfests are winding down and festivals start heading indoors for the rest of the year. Prepare for some big events this month! 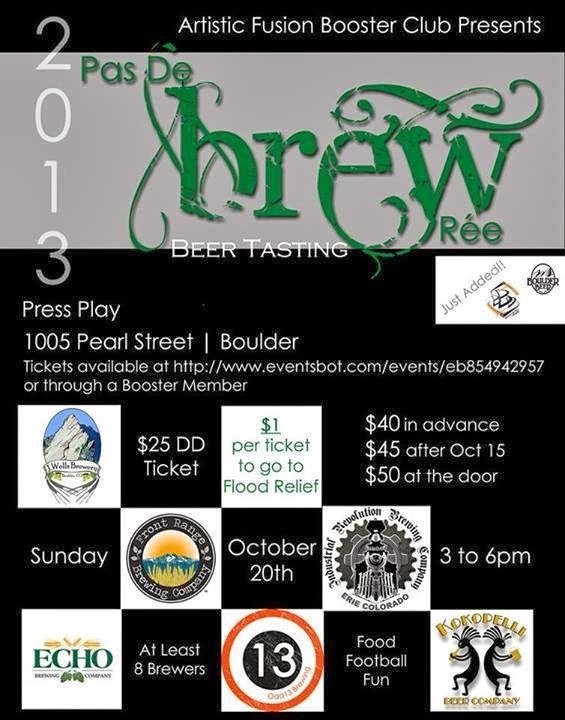 Here's the calendar of upcoming Colorado beer festivals, tapping parties, anniversaries, seminars and related events for October 2013. This calendar is updated weekly, so stop back often to see the latest happenings with beer in Colorado. Dates, prices and event info are subject to change at any time so please check with the event web site before attending. If you know about another event not listed here please add a comment below. Front Range BBQ - 2330 W. Colorado Ave. Cost: Free to attend, pay per beer. 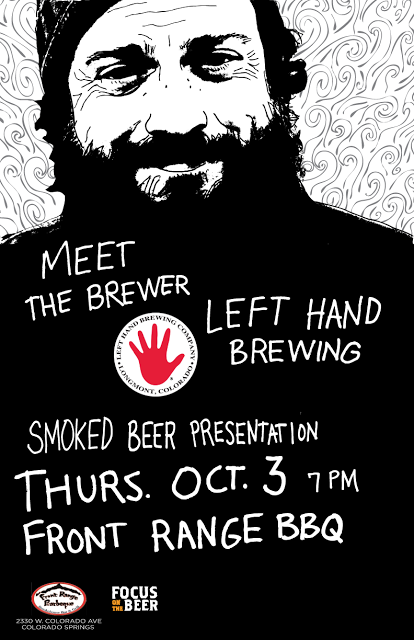 Come meet and listen to head brewer Ro Guenzel from Left Hand Brewing talk about the art of Smoked Beer. Ro has a profound attachment to smoke and many of his specialty beers used smoked grain, smoked pepper, and the like. Smoke, of course, has a long history in the lives of humans; if you wanted to be warm, if you wanted to cook, if you wanted to brew beer, smoke was an inevitable part of the process. Brewers went to great lengths to remove smokey character in beer, but now many brewers are interested in ways to bring that character back into the beer. For this Meet the Brewer event on October 3rd, Ro Guenzel will tell us more about smoke and give a slideshow presentation about the many smoked beers that Left Hand creates. He'll have two different smoked beers available. The first is Fade to Black Vol. 2, a smoked Baltic Porter that was a Focus on the Beer favorite in 2010, and has now been re-brewed. Additionally he'll have the lovely Smoke Jumper Imperial Porter. There will also be a selection of non-smoked beers as well including Left Hand's German-style Oktoberfest beer. Left Hand will have some door-prizes for visitors as well. Multiple venues across the metro area. Time: All week long and all day long. Beer is booming in Denver! The city is packed with brewpubs, each boasting its own handcrafted takes on ales, stouts, lagers and all other sorts of suds. There will be organized tours, dinners, tappings, parties and more! Something for every beer fan. It's one of the biggest celebration weeks in Colorado! Look for specific events to be announced starting in September. 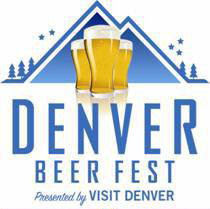 Go visit www.denver.org/denverbeerfest for a complete list of events and activities associated with the celebration of everything beer in Denver. Cost: $7 admission. $5 for 4 samples. Hard cider is becoming the next big thing in craft beverages. 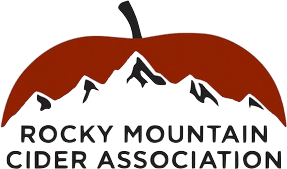 Come taste hard ciders from members of the Rocky Mountain Cider Association member cidermakers from Colorado and Montana plus guest ciders from England, France, Spain and New Zealand. Must be 21+ to sample ciders. Ciders are a great gluten-free alternative to craft beer. Contact (303) 759-3560 for more info. This is the 16th annual kick-off party to the Great American Beer Festival. Expect to see some great beers brought in on tap. Come early as the line to get in is expected to be long! Falling Rock Tap House acts as the unofficial before and after destination for beer drinkers during GABF week. Come see why this place is constantly rated as one of the best beer bars in the world. Visit fallingrocktaphouse.com for more info. Cost: TBA - on sale Sept. 14th 10am. Learn how the glassware you use changes your enjoyment of our favorite beverage, Beer. Limited seating, held downstairs, tickets on sale starting September 14th 10am (Mountain) & includes Beer & a 4-piece Spiegelau Beer Connoisseur Glass Set (retail Value $50) including the new IPA glass (a joint project of Dogfish Head, Sierra Nevada & Spiegelau) released earlier this year. More info at: fallingrocktaphouse.com. Wynkoop Brewing - 1634 18th St. Cost: $30/pp unlimited tasting. Available from Wynkoop. As beer lovers from around the country gather in Denver to celebrate the Great American Beer Festival and the Denver Beer Fest, we thought we would give these beery visitors a taste of the great state of Colorado. 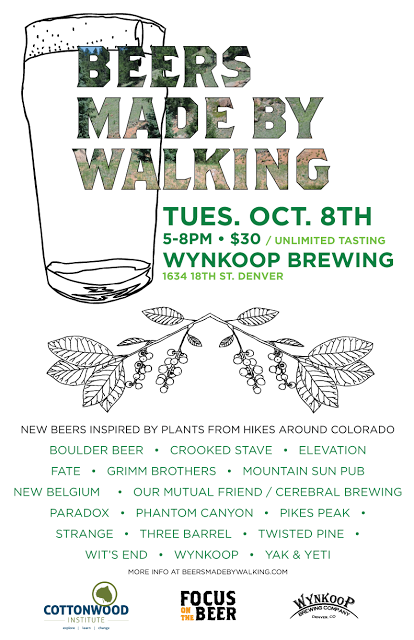 Beers Made By Walking has invited seventeen breweries across the state to take a hike, literally, and then make specialty beers inspired by the edible and medicinal plants found along the trail. These seventeen beers, made specifically for this event, will be available for one night, Tuesday, October 8th, at Wynkoop in Denver. Each beer in this series is innovative in that they are drinkable landscape portraits of areas throughout Colorado. You'll get to taste a portrait of Boulder’s historic Chautauqua Park, the Palmer Lake Reservoir Trail in Colorado Springs, a beer inspired by a neighborhood stroll in Denver, and many others. More info on their Facebook event page. Cost: $35 per person. SOLD OUT!! Come sample some freakishly exotic rare beer from your favorite Colorado breweries at the Rackhouse Pub’s 2013 Colorado Rare Beer Tasting. Miss out and you will never forgive yourself! One night only, at the Rackhouse Pub on October 9, 2013 from 6-9pm. Buy a ticket and receive unlimited samples (within reason), a buffet, and a chance to try some rare beer! 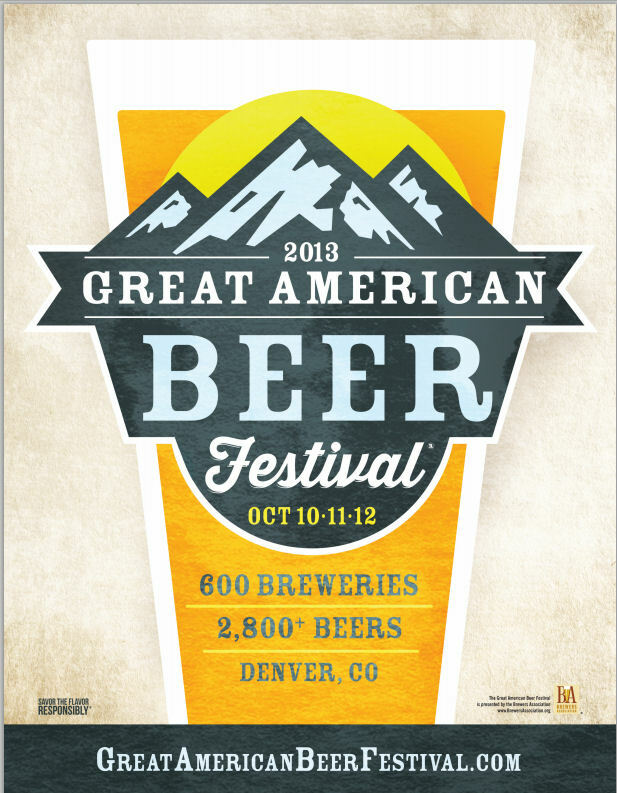 It’s a perfect companion festival to the Great American Beer Festival. Over 20 breweries are expected to participate. Buy tickets at BrownPaperTickets.com. More info at: www.rackhousepub.com/2013-colorado-rare-beer-tasting/. 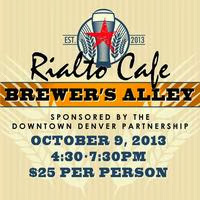 Imbibe in beer tastings from local brewers & delicious food pairings from Rialto Cafe. This event will be the first of its kind in the alleyway between Curtis and Champa Streets off of 16th Street Mall. Participating brewers include: Boulder Beer Company, Renegade Brewing Company, Ska Brewing, Bristol Brewing, and Upslope Brewing. It's to be a beer garden atmosphere you won't want to miss. This event is sponsored by the Downtown Denver Partnership. For tickets and info visit: brewersalley.eventbrite.com. Time: Thurs, Fri, Sat night 5:30pm - 10pm, Sat. afternoon 12pm - 4pm. Cost: ~$80 per session. SOLD OUT!! This is one of the biggest beer festivals and beer competitions in the world and the most popular in Colorado and the US! Four sessions, nearly 600 different breweries, over 2800+ beers. Even hundreds of ProAm beers will be available - all searching for the Gold, Silver & Bronze medals. 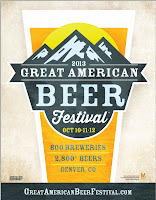 This is the 32nd annual GABF and will be even bigger than last year. Over 49,000 people will attend and thousands will volunteer for this event. Every imaginable beer you can think of will be pouring here at the GABF. Tickets sold out lightning fast within 20 minutes. Put this event on your beer bucket must-see list. Official web site. Avery Brewing Company and Euclid Hall Bar & Kitchen are welcoming Great American Beer Festival attendees in great American style for the third year with Midnight Breakfast at Euclid Hall right after the first GABF session on Thursday, October 10th. The doors at Euclid Hall open at 10:45 and the breakfast gets underway at 11:00 p.m. Tickets for this late night beer breakfast are $100 per person (tax and gratuity included). Billed as a late night beer breakfast of epic proportions, the culinary crew at Euclid Hall and Avery Brewing Co. have conspired to create a nine course sit down breakfast. Look for special Avery brews like Ross's's' Melange, Momi Hiwa, Tweak and the unreleased Thensaurum, a sour ale aged in rum barrels. There always seem to be some surprise appearances from special Avery beers at Midnight Breakfast. More info at www.euclidhall.com or at 303-595-4255. Tickets at: www.brownpapertickets.com. The 19th annual KROC World Brewers Forum will be held on Thursday, October 10th from 8pm - 12am at the Denver Marriott City Center. Our speakers this year are: Jeremy Cowan, owner and proprietor of Shmaltz Brewing and author of Craft Beer Bar Mitzvah, and Colin Kaminski, co-author of Water: A Comprehensive Guide for Brewers and brewmaster at Downtown Joe's Brewery in Napa, California. The theme this year is "19 Years and Still Going Strong!". Come sample one or many of the 19+ homebrews on tap during the event. During the event, winners of the 7th Annual KROC Great American Beer Challenge will be announced, and awards will be given out. The entry window is currently open and will close on September 14. Submit your entry now! A drawing and a silent auction will be held during the event. Prizes up for grabs include gift certificates, glassware, t-shirts, growler fills, and more! You never know what's going to show up in our silent auction - previous years have included bags of grain, learn to homebrew kits, food tastings, beer for a year, and homebrew equipment. 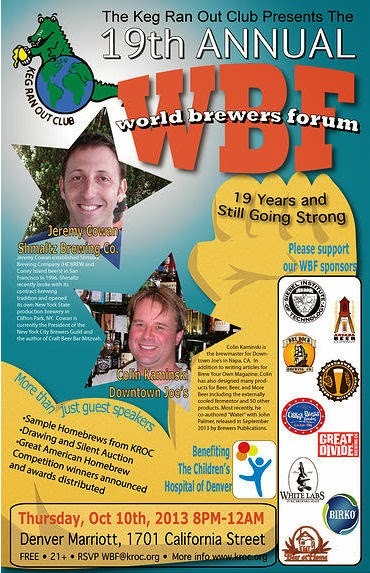 The event is 21+ and free to all, but please RSVP to wbf@kroc.org. IDs will be checked at the door. Euclid Hall Bar & Kitchen will be hosting a sour beer symposium with Lauren Salazar, the Wood Cellar Manager and Blender/Specialty Brand Manager for New Belgium Brewing Company. Lauren will be presenting in the upstairs dining room for TWO sessions on Thursday October 10th 2013. The workshops run early in the day so you can get to the first session of the Great American Beer Festival by 5:30pm! This workshop is a once in a lifetime experience and have been held in cities such as Chicago, Asheville, Portland, San Diego, and Washington DC. Spaces are limited and both sessions will sell out. If you have any questions please call Euclid Hall directly at (303)595-4255. Session 1 tix - Session 2 tix. Epic Brewing’s First 50 Firkin Fiasco follows their creed of small batch, huge selection. The event features 50 unique cask ales that showcase Epic’s considerable beer selection and the creativity of its brewers. VIP passes include a gift bag with tasting glass, event t-shirt and a food voucher. Sample one-off beers like Imperial IPA high krausened with Hopulent IPA and cask hopped with whole leaf Cascade, Imperial Red Ale with cocoa nibs, and Utah Sage Saison with cracked black pepper corns. Don’t miss a great opportunity to explore their brand new brewery and taproom! Tickets at Eventbrite. McNichols Building - Civic Center Park. Cost: $100 each - SOLD OUT! Bigger location this year! Admission includes the chance to sample rare, exotic and vintage beers from more than 30 of America’s top craft breweries and the opportunity to meet the men and women who made them. Each attendee receives a commemorative tasting glass, t-shirt, program and pen. Guests also receive a three issue trial subscription to the award-winning All About Beer Magazine. A buffet lunch is included in the ticket price and guests will have the chance to bid in an exciting silent auction that includes a variety of unique beer experiences and collectibles. This event will sell out quickly. More info at www.pintsforprostates.org. Sherman Street Event Center - 1770 Sherman St. Cost: $83.79 incl. service fee - SOLD OUT!! Join in for the inaugural year of What The Funk?! an invitational festival showcasing all things barrel-aged, wild, sour, and funky. These beers push the boundaries of style, often blurring the lines between beer, wine, and spirits. 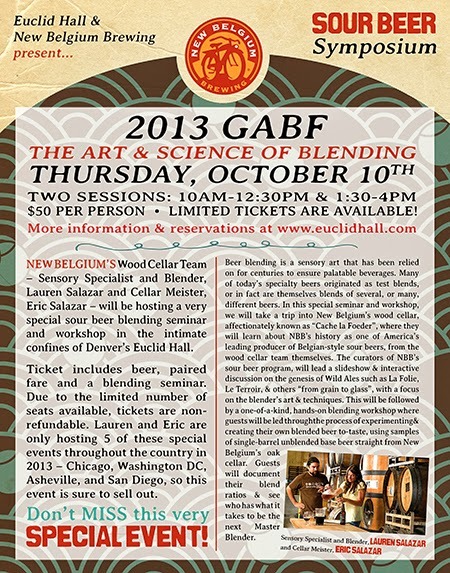 Every year there is an amazing gathering of brewers and aficionados for GABF and Denver Beer Week. This year Crooked Stave Artisan Beer Project has thrown their hat into the ring to bring together some of our closest friends and brewers who are making exciting beers. The plan is to invite 30+ brewers from across the US to pour their exciting barrel-aged and most creative beers in a forum where these beers are best spot lighted! With the brewers on hand to talk about the beers, this is sure to be a unique event amongst the many quality events throughout the week. Tickets at: letsgetfunky.brownpapertickets.com. Cost: Free entry, pay per beer/food. 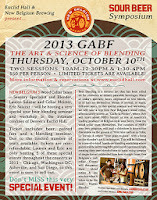 Save the date during GABF! 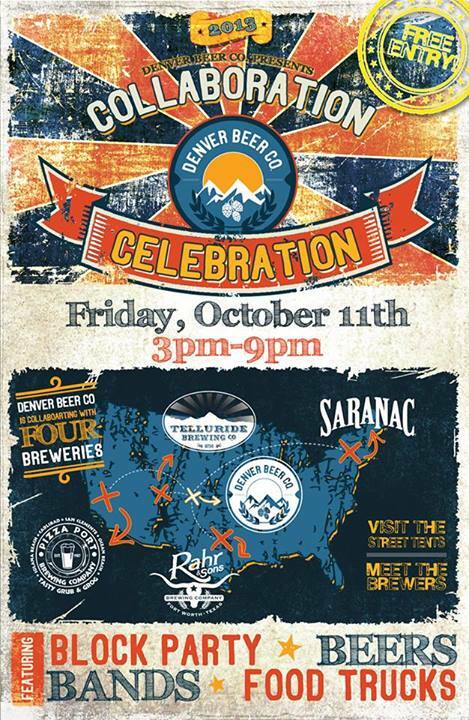 Coming next month, Friday, October 11th from 3pm to 9pm is a Collaboration Celebration. Denver Beer Company got together and collaborated on a separate beer with 4 other brewing companies and are throwing a party and closing off the street. They collaborated with Pizza Port (California), Telluride Brewing (Colorado), Rahr & Sons (Texas) and Saranac Brewery (New York) and came up with 4 unique brews. There will be live bands, food trucks and a big block party just a few blocks NW of Coors Field. Party is free to enter. The after-GABF party! 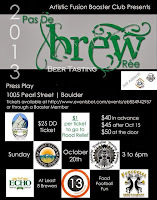 Join the Avery Brewing crew on a rare beer crawl between 3 locations in Denver (LoDo). Wear your bathrobe and relax after a long GABF week. 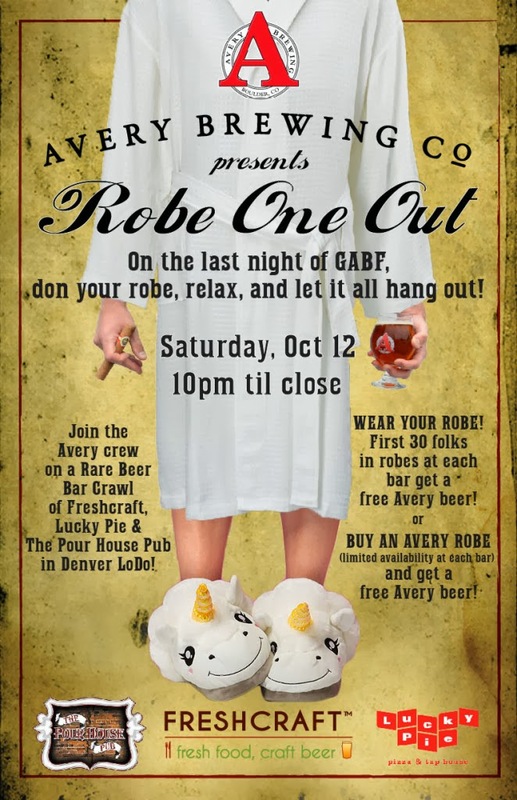 The first 30 people in robes at each bar get a free Avery beer - or - you can buy an Avery branded robe (while they last) and get a free Avery beer. This party will last until they close the doors at all 3 locations. There will be some rare Avery beers and tap room exclusive selections available at each location. Time: General Adm - 6:30pm, VIP - 6:00pm. Cost: $30 General, $50 VIP. 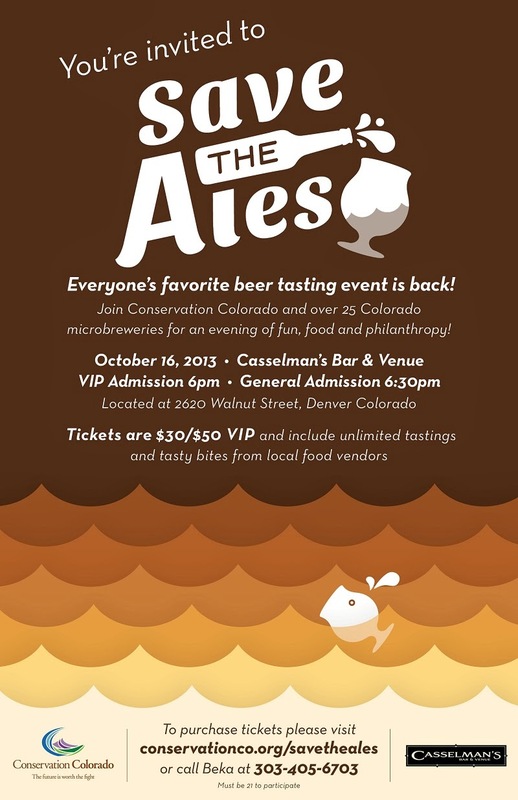 Join Conservation Colorado and over 25 Colorado breweries for an evening of fun, food and philanthropy. One of beer’s most important ingredients, hops, is extremely sensitive to the adverse effects of climate change. So, help us Save the Ales! You ticket will include unlimited tastigns and tasty bits from local food vendors. All proceeds benefiting Conservation Colorado’s efforts to help protect Colorado’s air, land, water and people. VIPs get a commemorative pint glass, early entry and 1 free entry for the ARRAY OF ALES drawing. Tickets are available from conservationco.org/savetheales. Must be 21+. Cost: $25 Adv, $30 at door. While Falling Rock Tap House is focusing on plans for the GABF, they are also making plans for what comes AFTER GABF as well. On Saturday, October 19th from 12-5pm it's the 8th annual Falling Rock Fresh Hop Fest. Come sample over 25 beers brewed with fresh harvested whole hops, in many cases these hops were added to the brew within 24 hours of being picked from the vine. This event will showcase beers from Colorado and West Coast brewers using fresh hops in IPAs, Pale Ales, Brown Ales, Belgians and Stouts. Only 250 tickets are available for access to these one of a kind beers, secure yours now because this will sell out. 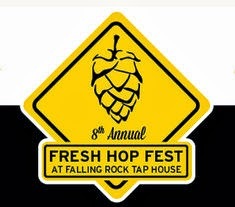 Proceeds from The 8th Annual Falling Rock Fresh Hop Fest with benefit the Colorado Brewers Guild. Details at: fallingrocktaphouse.com. Time: All day starting at Noon. GABF may be over, but we know your thirst for beer doesn't end there. 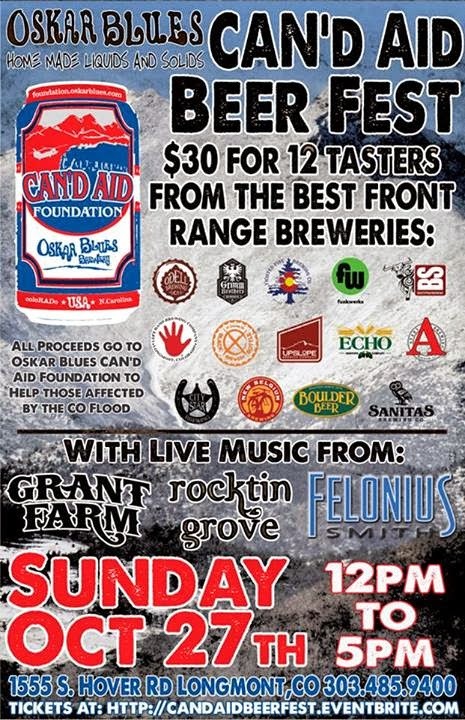 Plus, this is the only Pumpkin Beer Festival happening in Denver this weekend! (That they know of). 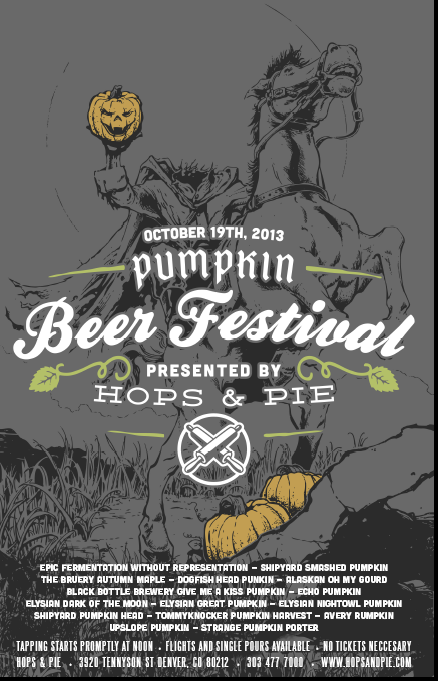 Come to a gathering with over 15 different pumpkin ales to choose from. Beers from Epic Brewing, Shipyard, The Bruery, Dogfish Head, Alaskan, Black Bottle Brewery, Echo Brewing, Elysian, Tommyknocker, Avery, Upslope and Strange Brewing. Flights and single pours will be available. No tickets necessary. Oh my gourd - get your pumpkin on at this little (but big) pumpkin fest! Full food menu is also available. www.hopsandpie.com. Cost: $45 adv, $50 at door. Odell Brewing Taproom - 800 E. Lincoln Ave. Cost: $25 adv. or $30 at the door. 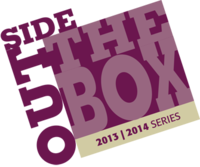 The Fort Collins Symphony is doing a series of musical events called "Outside the Box" and is bringing classical music to unique venues. This time, they're pairing Bach and Beer into a special setting - Odell Brewing Company's taproom! This event will showcase Joel Bacon on harpsichord and Chris Jusell on violin. Tickets include music, small food pairings from Mouco (cheese) and two beers of your choice from Odell. Tickets can be purchased online on the Ft. Collins Symphony website or by calling their office (970) 482-4823. - Ska/DC Brau Taster's Choice Release Party + Concert - Oct. 11 - Marquis Theater - Denver,CO.